Could it be true or yet another hoax? When a recent press release about finding real bigfoot evidence BIGFOOT PRESS CONFERENCE JUNE 23, 2011, 4:00 P.M. PDT, FRESNO, CA, and proving to the world that the creature is a real live cryptid came to my attention, I was immediately intrigued and searched to see if anymore info had surfaced. Though not many news sites or blog's or forums were carrying the news, I awaited patiently to see what would be the news media's stance. And once more I wonder to myself if this once again is the real deal about to make history. Sadly as many will see at this time the media buzz about this is not as big as the great bigfoot hoax of 2008 and understandably everyone knows why. Basically no one wants to be duped again. Established world renowned Bigfoot believers, trackers and hunters all agree that many of the sightings are always hoaxes or misidentified known animals. Cryptozoologists Loren Coleman and Diane Stocking have estimated that as many as 70 to 80 percent of sightings are not real. But this new evidence that the Sanger Paranormal Society will present is being touted that it will potentially be the most convincing real evidence of Bigfoot since the Patterson film of 1967. California Bigfoot investigators were shocked over Memorial Day weekend when they found strange markings and hair on their pickup truck windows. Now, they're hoping DNA tests will prove once and for all the existence of the legendary man-beast. "On the passenger side window, when I first saw it, I almost threw up," said Jeffrey Gonzalez, an AT&T electronics technician and founder of the Sanger Paranormal Society. Gonzalez and several others were in California's Sierra National Forest searching for evidence to confirm the reality of the creature. When it started to snow at their campsite, they were forced to leave two of their vehicles behind. 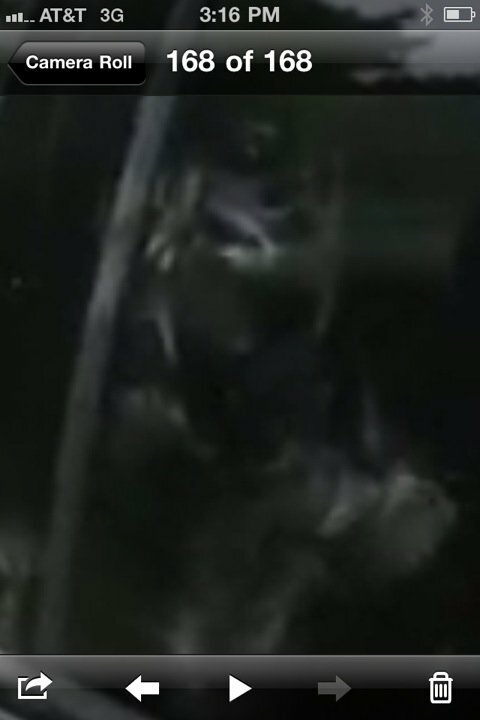 Sanger Paranormal has released a footprint photo to AOL News, with the notes that it was found near the truck, and measured 12 inches long. Frankly, I think the lower imprint looks like a boot print, and I wonder if the one in the middle of the photo is also a human print. These prints are being associated with the face print, but there is no evidence of a direct connection, at all. Sanger Paranormal Society will present potentially the most convincing evidence of Bigfoot since the Patterson film of 1967. (TRAVPR.COM) UNITED STATES - June 20th, 2011 - JUNE 19, 2011 - FRESNO, CA - On June 23, 2011, the Sanger Paranormal Society will present potentially the most convincing evidence of Bigfoot since the Patterson film of 1967. The media event, scheduled for 4:00 p.m. PDT at the Piccadilly Inn in Fresno, CA, will feature a full upper body impression, including half of its face, on the passenger side window of a pickup truck. The driver's side window features a Bigfoot's nostrils, nose, and lips. Jeffrey Gonzalez, Founder of the Sanger Paranormal Society, expressed confidence in the evidence, while clarifying the Society's affiliation. "No, it's not a Bigfoot in a freezer, and we are not affiliated with those guys in any way," he said. "This evidence was captured during an expedition in the High Sierras of California during the Memorial Day weekend of 2011." 1. An award-winning high school principal with a Masters Degree. This former science teacher and former investigator for www.BFRO.com has been investigating Bigfoot for 15 years. 2. A Licensed Vocational Nurse who spent 14 years in the military, and who was featured on an episode of Monster Quest titled, "The Sierra Sasquatch." 3. Someone employed at AT&T for 11 years who has an Associates Degree in Electronics and is the Founder of the www.SangerParanormalSociety.com. Sanger indicated that a Forensic Specialist with 14 years of experience was called out to take photos and swab for DNA from the windows. This location where the evidence was captured is known for heavy Bigfoot activity, and has been regularly visited by the investigators mentioned above. Members of the media wishing to attend the press conference should RSVP to SangerParanormal@aol.com. The Sanger Paranormal Society will contact you to confirm your attendance. Jeffrey Gonzalez- founded the Sanger Paranormal Society 3 years ago after noticing a lot of Paranormal activity in Central California. Jeffrey has had a interest in the Paranormal ever since he saw a UFO over the skies of Sanger at a young age. He is also the State Section Director and Investigator for the World's largest reporting agency for UFO"S, "MUFON". He has a Degree in Electronics where he works as a Technician for AT&T. He also has knowledge in security cameras and security systems which allows Jeffrey to put what he knows to work in solving the mysteries of the Paranormal. I initially called Jeffrey while I was on the Metro going home from work. He wasn’t in the position to talk so I had to return the phone call the next day. Although Jeffrey was at work when I called, he was happy to set some ten minutes aside and fill me in on what was going on. “It’s been crazy the last few days, but we’re all very excited” Jeffrey said. He had posted an photograph that he took of the imprint using his iPhone. The photo was posted on Facebook first, but as soon as Jeffrey’s other colleagues saw the public’s reaction to the photo, they knew that what they were sitting on could be big. Real big. Uploaded by TheMufonman on Jun 17, 2010 ... We spent the night at the spot where the Bigfoot Photo was captured last year. This time, Jeffrey Gonzalez took his infrared equipment in hoping on capturing the famous Sasquatch while we slept. As I and many others await the news from Jeffrey Gonzalez and Sanger Paranormal Society Bigfoot Investigation proof we can only think back to past info that others have duped us into believing. Though as I myself and many many others will state in the bigfoot investigation community today, we do so hope that their proof turns out to be legitimate. Close-up of the "paw" print image. 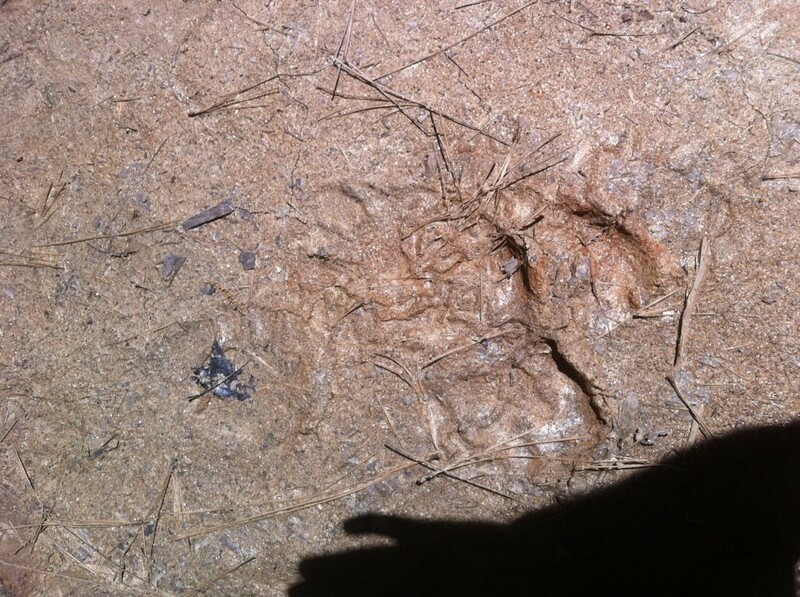 The impression was reportedly left by Bigfoot on the window of a pickup truck in the California Sierra National Forest over Memorial Day weekend 2011. Bigfoot or bear? Pictured is a second impression left on the rear side window of the same truck from the previous slides. According to forensic/law enforcement photographer Mickey Burrow, "What you're seeing is a swipe mark. It looks like a small hand, swiping to the left, leaving another impression, and there's hair within those areas -- you can see where the hair would be." On July 14, 2005, Tom Biscardi appeared on the radio program Coast to Coast AM and claimed he was "98% sure" his group would be able to capture a Bigfoot near Happy Camp, California. On August 19, he returned to say he knew of the location of a captured Bigfoot specimen, and that he would air footage of the creature through a $14 web-cam service. However, on the day the footage was to be distributed, Biscardi claimed he was "hoodwinked" by a woman in Stagecoach, Nevada, and that the specimen did not exist. Coast to Coast AM host George Noory demanded that Biscardi refund the money to people who had paid for the web-cam subscription. Biscardi then offered a refund on his website to those who had subscribed for the service after August 19. Loren Coleman, a writer on the Sasquatch, Yeti and other mysterious creatures, said publically he thought that this was going to be one of the biggest Bigfoot stories of the decade, even it turns out to be hoax. Two Bigfoot hunters, Matthew Whitton and Rick Dyer, say they have the carcass of the creature, left. From left, Mr. Whitton; Tom Biscardi, a Bigfoot booster; and Mr. Dyer. Biscardi also tried to reassure the media of the corpse's authenticity, saying, "Last weekend, I touched it, I measured its feet, I felt its intestines."
. Whitton boasted, “Everyone who has talked down to us is going to eat their words." Below is RDYER678's follow-up to the video purporting that a Dr. Paul Van Buren (who was in actuality Matthew Whitton's brother, Martin) had studied a sasquatch corpse. In this original video, the "bigfoot trackers" admit to perpetrating an online hoax. From small towns in the South to remote areas of the Pacific Northwest and Alaska, four eccentric but passionate members of the Bigfoot Field Researchers. Matt Moneymaker was born and raised in Los Angeles, California. He developed an interest in the bigfoot legend at the age of 11 after watching the famous 1970's documentaries on the subject. While attending UCLA in the 1980's he began corresponding with other bigfoot researchers in the United States and Canada. His first track discovery was in the mountains of Ventura County, California in 1987. In the early 1990's he moved to eastern Ohio where many sightings and encounters had been reporter by farmers during the previous 10 years. His first close encounter with a bigfoot occurred during an overnight stakeout in a swampy wildlife refuge southeast of Kent, Ohio in 1994. In 1995 he connected with other bigfoot researchers on the nascent World Wide Web and formed the Bigfoot Field Researchers Organization. In 1996 he launched the web site for the BFRO and began investigating and publishing eyewitness reports on the Internet. He organized the first big expedition for the group in 2000 in Skookum Meadows, Washington. For the next few years he co-produced a few television projects about the bigfoot subject before he began organizing field expeditions in different parts of the country, which he still does today. ... the first person who introduced sound blasting and howling as a technique for locating bigfoots. ... the first person who proposed and argued the connection between bigfoot sightings and deer kill stashes, after being shown evidence by Mennonite Farmers in Ohio. ... the first person to record the long moaning howl of a big male sasquatch — the "Ohio Howl." ... the first to formally describe the knock sounds made by bigfoots in 1992, at a scientific conference at Rutgers University for the International Society of Cryptozoology. ... the first person to organize big expeditions to gather observations and evidence in various parts of North America. ... the first person to debunk the "Georgia Bigfoot Body" hoax in the summer of 2008. Level-headed and analytical, Cliff has a keen interest in physical evidence. A Smart Monster Is A Dangerous Monster! Finding Bigfoot' Hoax Exposed - By the Cast! Bigfoot Face: Could This Be The Holy Grail? Is the Existence of the Florida Skunk Ape True? ASquatchdetective.com, a no nonsense inquiry into the Bigfoot/Sasquatch mystery. For additional information or reservations about Appalachian GhostWalks' East TN Ghost Tours, Tennessee History Tours, or the new "Legendary Cherokee Bigfoot Adventure Tour" - or any of several fun family haunted themed vacation packages, please visit the Appalachian GhostWalks website online at http://www.AppalachianGhostWalks.com or call (423) 743-WALK (9255).